During development, some synaptic connections between neurons are removed by immune cells called microglia, and others are retained. The discovery of a ‘don’t eat me’ signal that prevents excess pruning sheds light on this process. Serge Rivest is at the CHU de Québec Research Center and in the Department of Molecular Medicine, Faculty of Medicine, Laval University, Quebec City G1V 4G2, Canada. The signals transmitted between neurons through synaptic connections are responsible for most, if not all, brain functions, from learning to decision-making. During brain development, synapses that are stimulated less often than others are eliminated through a process called pruning, whereas those that are highly stimulated are retained. This refines the brain’s ability to respond to stimuli and environmental cues. Microglia, the brain’s innate immune cells, have a key role in pruning — they engulf and digest synapses through a process called phagocytosis. But the mechanism that determines which synapses they avoid has been unclear. Writing in Neuron, Lehrman et al.1 describe a ‘don’t eat me’ signal, involving a protein called cluster of differentiation 47 (CD47), that prevents inappropriate synaptic pruning by microglia. About a decade ago, it was shown that synapses requiring elimination send an ‘eat me’ signal to microglia2 (Fig. 1a). This signal involves the proteins C1q and CR3, which are part of the complement cascade — a complex series of interactions that is best known for activating cells of the innate immune system to eliminate disease-causing organisms and damaged cells. 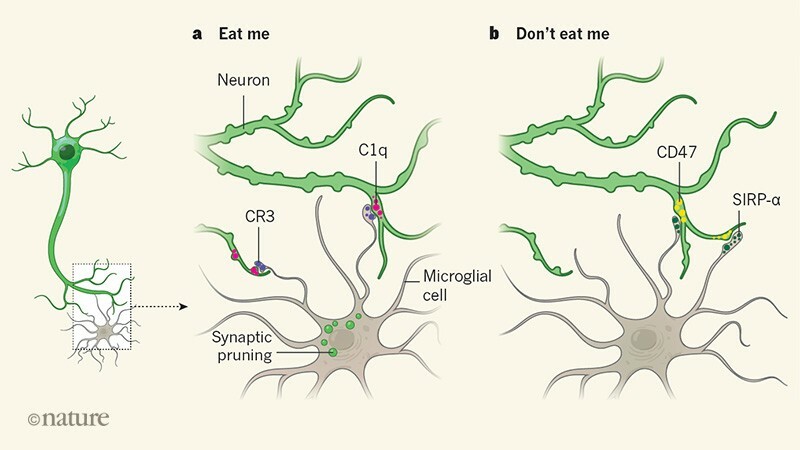 ‘Don’t eat me’ signals act to limit the effects of ‘eat me’ signals in the immune system, but it was not known whether the same process occurs during synaptic pruning in the developing brain. Figure 1 | Opposing signals in synaptic pruning. a, Unnecessary synaptic connections between neurons can be removed during brain development in a process called pruning, in which the termini of neurons leading into synapses are engulfed and digested by microglia — the brain’s innate immune cells. Synapses destined for elimination release an ‘eat me’ signal, in which an immune protein called C1q signals to the protein CR3 on microglia to promote pruning. b, Lehrman et al.1 report an opposing ‘don’t eat me’ signal. The protein CD47 is expressed on active synaptic termini, and signals to its receptor SIRP-α on microglia, discouraging the immune cells from digesting the synaptic terminal. CD47 is a cell-surface protein that has many immune functions, including acting as a ‘don’t eat me’ signal for macrophages3, microglia’s sister cells, which exist outside the brain. Lehrman et al. analysed whether CD47 is expressed in the dorsal lateral geniculate nucleus (dLGN), a region of the brain involved in vision. This region receives inputs from neurons called retinal ganglion cells (RGCs) that originate in the retina. The authors demonstrated in mice that, at five days after birth, synapses from RGCs to other neurons in the dLGN are being pruned at high levels. Lehrman and colleagues found that CD47 was expressed at higher levels in the dLGN than in other brain regions at this time. Moreover, the protein SIRP-α, which acts as a cell-surface receptor for CD47, was highly expressed by microglia at the same developmental stage. Using a super-resolution imaging technique, the researchers showed that CD47 was located in 25% of synapses in the mouse dLGN 5 days after birth. Next, the group investigated whether CD47 functions as a ‘don’t eat me’ signal in this context. First, they measured phagocytosis of synaptic material in mice genetically engineered to lack CD47. They found that microglia engulfed more RGC inputs in CD47-deficient mice than in their wild-type siblings. The mutant mice also displayed higher levels of pruning than did controls, and had fewer synapses in the dLGN by ten days after birth — a change that persisted into adulthood. The authors observed a similar phenomenon in mice lacking the gene that encodes SIRP-α, indicating a possible CD47–SIRP-α interaction on microglia. The researchers used various in vitro approaches to test whether CD47–SIRP-α signalling could prevent the phagocytosis of isolated synaptic termini, called synaptosomes. These analyses revealed that microglia lacking SIRP-α engulfed synaptosomes more efficiently than did wild-type microglia, and that microglia preferentially engulfed synaptosomes lacking CD47 over wild-type ones. Together, these data indicate that CD47–SIRP-α signalling acts as a ‘don’t eat me’ signal to protect against excessive microglia-mediated pruning and synapse loss (Fig. 1b). Blocking or disrupting neuronal stimuli and environmental cues to neurons can alter synaptic pruning and refinement in many brain regions4. To investigate whether activity-dependent changes in synaptic CD47 might determine which synapses are removed, Lehrman et al. set up an artificial competition assay, in which they used the neurotoxin tetrodotoxin (TTX) to suppress neuronal activity in one eye in mice. They found that CD47 levels were higher in synaptic inputs from RGCs that originated in the more-active control eye than in the inputs from the TTX-treated eye, suggesting that CD47 is either degraded or moves away from synapses in RGCs of the less-active eye. Finally, Lehrman and colleagues showed that, in wild-type mice, CD47 levels were higher in more-active than in less-active synapses, and that, in CD47-deficient animals, microglia showed no preference for less-active inputs. Together, the authors’ data indicate that protective ‘don’t eat me’ signals prevent aberrant microglial engulfment in the dLGN. As Lehrman et al. point out, a major challenge for the immune system is to remove dying cells, disease-causing organisms and toxic molecules without removing or damaging healthy cells. This study is particularly interesting in that regard, because the ‘eat me’ and ‘don’t eat me’ signals from synapses both act on microglia. Whether the complement system and CD47–SIRP-α act separately or interact to ensure that the correct synapses are removed or protected remains an open question. This aspect is also not clear for macrophages in the immune system. The mechanisms by which synapses that are either unwanted or to be retained send these signals to microglia remain to be demonstrated — in particular, the interaction between CD47 and SIRP-α in microglia as a leading factor in constraining synaptic pruning has not been shown directly and has been validated using in vitro models. The physiological relevance of this signalling pathway also needs to be examined, because CD47-deficient mice do not seem to have major defects in brain development5. Another question is whether these events modulate other innate immune responses in the brain, such as those involved in disease. For instance, in multiple sclerosis, a sheath of a fatty substance called myelin that insulates neurons becomes damaged. Microglia have a key role in removing damaged sheaths to enable remyelination6; perhaps ‘eat me’ and ‘don’t eat me’ signals help the microglia to determine whether myelin should be removed. Synaptic protection is essential for normal brain development. The identification of a ‘don’t eat me’ signal in microglia reveals a new aspect of this crucial developmental phenomenon. Lehrman, E. K. et al. Neuron 100, 120-134 (2018). Stevens, B. et al. Cell 131, 1164–1178 (2007). Oldenborg, P.-A. et al. Science 288, 2051–2054 (2000). Stellwagen, D. & Shatz, C. J. Neuron 33, 357–367 (2002). Koshimizu, H., Takao, K., Matozaki, T., Ohnishi, H. & Miyakawa, T. PLoS ONE 2, e89584 (2014). Lampron, A. et al. J. Exp. Med. 212, 481–495 (2015).